@kaktus On custom jobs, that has been what we have discussed in the past. Are you getting many custom orders? But I am not a representative sample, to be fair. Another question comes to mind, now with backorders gone, when I go on vacation, should I just make the product “not in stock” and put maybe a message on the store? I am just a hobbyist who does this in his free time. Another question comes to mind, now with backorders gone, when I go on vacation, should I just make the product “not in stock” and put maybe a message on the store? I am just a hobbyist who does this in his free time. what about cases of special order/custom product? For example I have a customer who comes back once in a great while and wants a bazillion of my widgets. I do not stock that many, and backorders work very well for that. I keep normal volumes in stock for typical onesies/twosies customers of course. If i had a “special/custom” order way to offer for them to use, I suppose that could work well. Wishlist though is not well suited for this as there is a large capital investment to place on a “wish” with no real assurance it will turn into buy. I do realize I can also just bill them directly, but I’d prefer to stay here! Some type of a quote request/reply, with seller able to respond back with timing/cost and shipping charges would be nice. A tought hit me: what if a student wants to sell a product he just made? Is he stuck with producing a therefore expensive product in low quantities? No way to use the backorders as way to decrease the cost? How could he scale up? A tought hit me: what if a student wants to sell a product he just made? Is he stuck with producing a therefore expensive product in low quantities?No way to use the backorders as way to decrease the cost? How could he scale up? Is’t that what crown funding campaigns are for? They seem all the rage now. I happened across this one last night. I laugh, maybe even cried a bit. Got to hand it to him, it is pretty creative. Making a successful crowdfunding campaign costs money (I should know). Agreed, but then so does a successful Tindie listing. At the end of the day, this argument is an endless circle of ‘To do X, you need money’ - from prototyping, creating a crowdfunding campaign, inventory to scaling. At what point do we just say, “That is the responsibility of the business”? Because something costs money doesn’t mean it is the customer’s responsibility. It’s not the customer’s responsibility. But I thought one of the goals of Tindie was to make it easier for people with a cool idea to find customers? Part of that includes practical issues like this one. @kuzyatech rant away. I’m happy to talk about this! The truth is the waitlist has always been here and is the default solution. 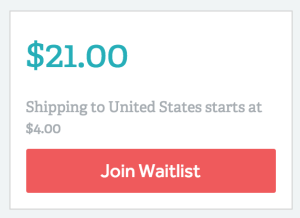 If a seller never activated backorders, the product would automatically start a waitlist. So the data we have is products that use waitlist vs those with backorders. The data we have shows the backorderable products do significantly worse that waitlist products. Our aim is to provide the best possible environment for a project to see it’s full potential. If we know backorders actually hinder that, we honestly can’t keep it around - it is in direct competition with our goal & the interests of the seller. I understand your hesitancy. However in this overwhelming case, it is just brutally clear. It’s as simple as that. Seeed is no where near one of our best sellers (@kuzyatech you’ve got over 7x as many orders!). We’re a platform for small businesses like yourself. If we didn’t think this change was in your best interest, we wouldn’t do it. But it is - I think a year’s time this won’t be a big issue. To flip this, when was the last time you backordered a product from any website? I, personally, never have. That makes me think the data actually does reflect the right solution. Fair enough, Emile We basically need two things- way to start up a product slowly (aka bootstrap), maybe a variation of preorder of sorts (not a kickstarter/fundraiser like craze), and then a way for custom/special orders where price and timing are not predetermined in advance until quoted. You’ll just end up driving us little guys away and big guys like Seed studio etc will take over. I would also had Nexus 5, Asus Zen Watch, hot end for printrbot, but couldn’t because they didn’t allow backorders and when I got a notification from the wait list, they were all gone. It’s nice that you had some scientist to do sales research for you and optimize your profit, but you should also hire someone to optimize for sellers and buyers experience before you drive us all away. Friend of mine who is also selling here, told me you deleted his product, that was actually selling. @femtocow safe to say those are the minority of your purchases. The thing about Tindie is our success is 100% correlated with a buyer’s & seller’s experience. Because we don’t charge listing fees (FREE), our revenue is entirely tied to your (or any seller’s success). So yes we are optimizing for revenue - because more customers like to order in stock, and that helps sellers, and ultimately our bottom line. If customers liked backorder, we’d keep it - they don’t - so we have to make hard decisions on how to spend our time. The real point of your post is trying to make it seem like we are a disingenuous company that is trying to be jerks to the community. That is so far from the truth it is silly. We are a team of 3. We have limited resources and time. That means we must focus on the most important areas of the business that will make the entire community successful. In the last 6 months, we have removed a ton of features & changed much of the user experience. The result - sales & traffic are way up. Traffic was up over 30% last month, and we are on pace to set a sales record this month. The community has spoken - they enjoy a simpler experience. In an attempt to better that experience, we have been removing poorly selling products with bad listings. We do many manual changes behind the scenes (clean up description formatting as an example). However we can’t do everything. Over 4,000 products have been listed on Tindie. With 1 person helping sellers, you can see how that takes a ton of time. So the solution we have is to pull products that haven’t sold in over a year which we think could have a better description/photos. If you need some help, feel free to check some of these quick and easy tutorials we have put together here. 99% of the time the seller’s are totally understanding, and resubmit their product. I know of only 1 seller who wasn’t happy about this policy. My guess is that was your friend. So the truth is he hasn’t had an order in over a year. I’m not going to get into any more of the specifics.